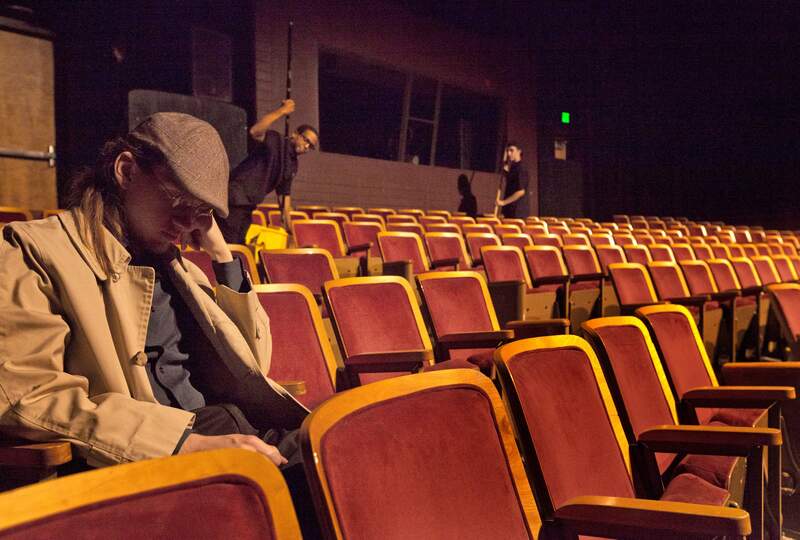 The cast of “The Flick” rehearses at Fort Lewis College this week. The play will open at 7:30 tonight. Once again, another weekend bubbles over with conflicting arts events. If you plan carefully, you can see all the new plays that launch the fall season at the college and the arts center. In addition, the San Juan Symphony offers its season opener Saturday night in Durango and Sunday in Farmington. And, in between, the MET Live in HD unspools its five-hour Wagnerian marathon, also at Fort Lewis College. The Fort Lewis College Theatre Department presents “The Flick,” by Annie Baker. In 2013, it premiered at Playwright Horizons in New York City and went on to win the Pulitzer Prize for drama in 2015. The Broadway production recently closed, but it’s running elsewhere around the world – and now – Durango. To say the least, it’s a coup d’teatre of sorts that FLC has secured the rights and opens its academic year with this remarkable play. Set in a fictional, ’50s-style movie theater, “The Flick” takes place in the present. Under the likelihood the theater will soon “go digital,” three co-workers lament changing technology and get to know each other. It sounds bare-bones, and yet this workplace drama is fraught with eternal human tensions: how we relate to one another; how we mask ourselves; how we come to terms with our lives; how we navigate through uncertain terrain; and how we learn about our own moral compasses. That’s the brilliance of Baker’s micro-naturalism. “The Flick” is something old and new at the same time. It’s not action-packed, not brimming over with theatrics or surrealism. It isn’t shocking or vulgar, sentimental or sensationalist. But it is full of the kind of bedrock conversation we all engage without realizing its deep significance. Having only read the play, I’m confident writing this. Now I can’t wait to see a production. Carson has cast three FLC students (Joshua Canada, Alicia Aron and Izaäk VanderBrug) and invited New York guest actor, Sharod Choyce, to round out the cast. The audience will sit on stage for the performance. With 60 seats available, patrons are encouraged to make reservations early. The Durango Arts Center presents the sixth annual 10-Minute Play Festival. The five finalists in the DAC competition for this year’s 10-minute festival will get full presentations this weekend. Stylistically, they range from witty, deliberately cliché-ridden dialogue with a British accent to two conversation-based vignettes not unlike Baker’s approach to naturalism. In between, you’ll visit a generational conflict over Thanksgiving dinner and an unexpected ending to a job interview. Out of a field of 107 scripts, DAC Theater director and her team selected 66 to move to a second round of judging. Out of those, 18 survived to a third round, and it all culminated in five finalists, presented as staged readings June 3. Audience members chose a favorite, and four local theater people – Marc Arbeeny, Ginny Davis, Mandy Gardner and Felicia Meyer – selected the grand prize winner. Wagner’s gargantuan opera, “Tristan und Isolde,” runs a bit over five hours. Once you’ve seen it, you’ll be exhausted, but you can brag about it. “Tristan und Isolde” is sung in German, but like all the MET Live in HD programs, it will have English subtitles. We’ll need them as the story is a bit convoluted, featuring a love triangle, star-crossed lovers, a king who waits, a sea voyage, a poison potion – or is it a love potion? – and a tragic ending. What does one to do with passion? The story is as old as ancient stone circles. Isolde is an Irish princess en route to marry a Cornish king. On board the ship, Tristan, the king’s nephew who is bringing her hither, captures her eye and heart. Like Lancelot and Guinevere or Romeo and Juliet and the many stories of doomed love that followed this early tale of doomed passion, there are few ways out. The great German opera composer Richard Wagner re-created the tragic story with fathoms of music to stir the soul. The Met’s new production updates the tale with a film noirish set, costumes and atmosphere. The Polish wunderkind film director Mariusz Trelinski applies a contemporary style that’s been referred to as audacious and thrilling. It opened in New York this week after openings with co-producers in Baden-Baden and Warsaw. If you saw the Met’s production of “Bluebeard’s Castle” last season, you know what’s meant by the film-noirish quality of Trelinski’s productions – dark, abstract and contemporary with a high shiver factor. The production stars Swedish soprano Nina Stemme. She is generally regarded as the world’s leading Wagnerian singer today. She’s joined by heldentenor Stuart Skelton as Tristan and the great bass Rene Pape as King Marke. Because of Durango’s popular response over the past few years, the ticket prices have been reduced – somewhat. Season tickets for 10 operas are $180. Individual tickets run from $23 down to another innovation, $5 for Fort Lewis College students with ID. You can thank Charles Leslie, director of the Community Concert Hall. Leslie arranged all that by just asking. “Tristan und Isolde” runs five hours, starting at 10 a.m. Saturday, with two 30-minute intermissions. Bring a pillow, a snack, a thermos, a blanket or wrap, and camp out in the Vallecito Room in the Student Union at FLC. It will be worth it. What: “The Flick,” a play by Annie Baker, directed by Theresa Carson. When: 7:30 p.m. today (Friday), Saturday and Sunday; Oct. 12,13,14 and 15; 2 p.m. Sunday and Oct. 16. Where: Fort Lewis College Mainstage. How Much: Adults $15, limit two applied to most reservations; seniors $10; FLC faculty and staff $10; FLC students $5; children $5. More information: www.durangoconcerts.com, 247-7657 or 247-7089. What: Sixth Annual 10-minute Play Festival. When: 7:30 p.m. today (Friday) and Saturday; 2 p.m. Sunday. How much: Tickets are $10 for DAC members, $12 general admission.